Keep life-saving tools with you. The American Red Cross CPR Keychain puts everything you need to perform CPR right in the palm of your hand. Minimum Order Quantity—5 units. Be ready to perform CPR wherever you go with the American Red Cross CPR Keychain with Face Shield and Gloves. The face shield features a one-way valve breathing barrier that helps prevent disease transmission, while enabling you to provide care when it's needed most. 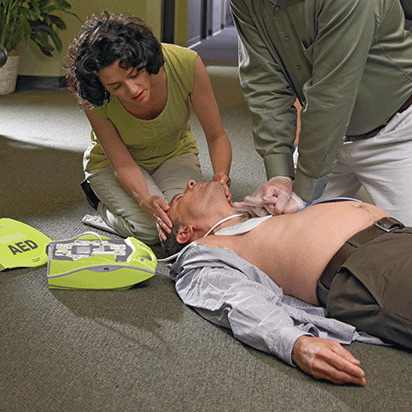 In addition, the shield includes a graphic indicating hand placement and proper head-tilt/chin-lift technique when for administering rescue breaths. It all comes housed in a handy portable keychain that you can carry with you or keep with the first aid supplies in your car, pocket or purse. PORTABLE ON-THE-GO PROTECTION: Convenient keychain ensure you are ready to give CPR wherever you are. EASY USE: Graphics indicating hand placement for administering breaths as well as a visual of the proper head-tilt/chin-lift technique. MULTI-USE: For use with adults and children as well as infants when minor placement adjustments are made. DISEASE TRANSMISSION PREVENTION: One-way Valve protects rescuer. CPR Keychain with Face Shield and Gloves is rated 4.6 out of 5 by 39. Rated 4 out of 5 by LadyMurd from wonderful gift for first timers. I bought these to give to folks taking CPR for the first time so they have something to use in case they ever needed to do CPR. Rated 5 out of 5 by MissEarthAngel from Very happy, thank you. I enjoyed the CPR class I took before buying these CPR key chains. I feel confident that in an emergency I could efficiently help someone in need. Thank you. I purchased several CPR key chains with face shields and masks. You never know when your going to need it so it's best to have it with you all the time. God bless. Rated 5 out of 5 by Bob the Builder from CPR Keychain with Face Shield and Gloves I bought the CPR mask and glove kit for my vehicles and friends. Rated 5 out of 5 by Ex first responder from Perfect to carry I carried one of these for many years in law enforcement and unfortunately had to use it a few times. I really recommend this product. Rated 5 out of 5 by Kmoelkers from Exactly what I needed! When I was finishing my training, the instructor showed us this remarkable tool. Now I keep one on my keychain at all times just in case. Rated 5 out of 5 by JK198 from Everyone should have these Just took a CPR class and was disappointed we didn't come away with either this or handouts. Glad they were available for purchase. Rated 5 out of 5 by Jersey boy 1963 from Handy CPR Tools The pouch with gloves and ventilator are perfect in order to have these tools available when needed. Rated 4 out of 5 by Trish69 from Great product My staff were so excited to receive this item. Great item.